It's only 1pm and I feel like I've done a full shift, but it's been very rewarding. We moved the pigs from pen no.1 to pen no. 2, where there is some grass. I put a bale of straw in the hut, since the remaining straw was a bit flat, thenw e seeded pen no. 1 with grass, phacelia and buckwheat - really anything we had spare in the garage. The pigs are very excited with their new pen and their improved bed, and have been galloping in excited spurts round and round, before stopping to munch grass. Yippee, a tray of mud! Our French Copper Black Marans, successfully hatched from eBay eggs, are now nearly a month old. They've been living outside for a week now, and have settled in well. We just wish they would learn to go to bed - they come down their ladder in the morning, and can often be found upstairs having a siesta in the afternoon, but when night falls they all huddle together downstairs shivering! They're very tame and queue up to be lifted into the top of their ark, but it's a pain in the backside. Read more on Yippee, a tray of mud! It was hot here last weekend so we rigged up a shower for the pigs. They like it a lot, as you can see! A shower for the pigs from asmallholder on Vimeo. The Cream Legbar eggs were due to hatch yesterday. I had a bad feeling about them, though. 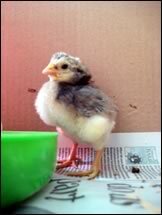 However, bang on time, one hatched so I set up the heat lamp in a box in the puppy cage and moved the first chick in there, hoping that a second egg, from which cheeping could be heard, would hatch too. When we got up this morning and the first chick was dead. It had moved away from the lamp, gone out through the bars of the puppy cage and died. I am really gutted that I didn't foresee this. I just never thought it would move away from the warmth. Have you ever seen a chick sleep standing up? We have. To try and make sure Chip didn't grow up into some kind of oddball, caused by spending his formative months with a felt mouse, we bought 6 day old Black Rocks today. Chip's world has been turned upside down. Unlike the felt mouse, these girls move, cheep, peck, push, shove. And really tire a wee Chip out! We have a little patio area under the kitchen window; it faces south east. As well as a slabbed area, there's a bed about this by that. 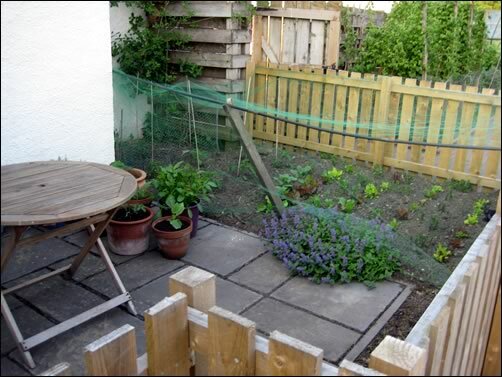 Last year, I had my "Three Sisters" bed there; this year, we've planted potatoes, with lettuce in between the ridges, eight tomato plants and a courgette. Plus a clump of catmint for Cassius. Regular readers might recall that we had a pond put in a few months ago. It's a fixed liner, but quite a nice shape with different levels. After we had it put in, I began to have second thoughts, but it was too late. I spent a month or so just looking at it in a desperate kind of way, unable to make any sort of decision about it. Pathetic, really. Anyway, about three weeks ago, we sorted the level (just about) filled it and bought some pond plants - marsh marigold, a water lily, a water iris, lobelia and some other bits (wish I'd kept the labels now). Having planted these, it looked a bit better.